Dark Oberon Game Review - Download and Play Free Version! Multiplayer using an internet connection. Limited amount of units and buildings. In Dark Oberon the storyline is simple, but the game play is deceptively fun! As you build, collect, and train resources and people, you'll fight for enemy terrain and continue to expand your glorious home base. 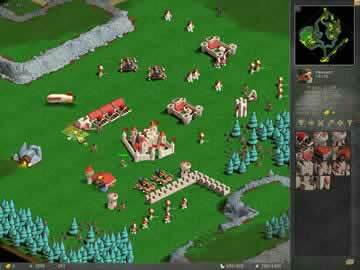 The game play is reminiscent of RTS classics such as Warcraft II. Dark Oberon is also easy on the eyes with its impressive graphics, parts of which were hand-molded in plasticine. You'll find a lot to like in this fun and free strategy with a lot of medieval charm. 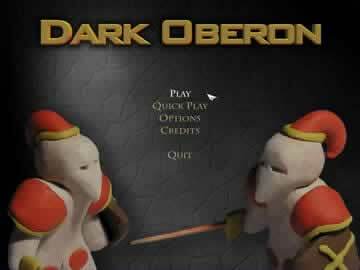 Dark Oberon is at best a partially completed game. Many necessary features of a good game are either not present or don't work. Not even the claymation style graphics can distract you from how lacking this game is. Limited options for building and a lack of opponents is just the tip of the iceberg. 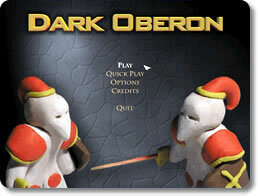 Using a medieval setting for the appearances of the game, Dark Oberon places you in command of a limited variety of soldiers to conquer the land. Unless you are playing with friends this will be quite easy. Computer opponents are completely inactive and will stand in the start location until you kill them. There is really a complete lack of things to do in this game. This game is similar to most real time strategy (RTS) games as far as the controls and gameplay go. You use peasants to construct buildings and harvest resources. Resources are timber and gold and can be harvested from mines and trees. There are a total of five different buildings that can be created. These are: barracks, town hall, defense tower, farm and factory. There are only two combat units, foot soldiers and catapults. There is also a blimp to transport soldiers. One of the only redeeming qualities of this game are the graphics. A claymation style is used and each character was modeled in real life then added to the game as a picture. This is a very unique method to use in a RTS game. The music is annoying. There is only one song and it plays over and over again. Characters spout off one liners when you click on them, some of which will make you laugh, most won't though. This game needs a lot of work before it could be an okay game. A serious lack of options and playability limit this game to those who have friends who also play Dark Oberon. Multiplayer is the only way you will get a challenge in this game. Stay away from this game until they come out with a new or upgraded version unless you can recruit your friends to play with you, it is free after all.